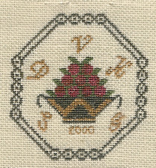 The Delaware Valley Historic Sampler Guild (DVHSG) is a nonprofit, educational needlework association. The purpose of the DVHSG is to promote and to teach the art of historic and contemporary sampler making, the study of sampler history, and contribute to the preservation of antique needlework samplers. Membership is open to anyone sharing a love of samplers and needlework. More than 60 strong, our members vary in levels of needlework knowledge and expertise - representing the Delaware Valley and beyond! The two-hour monthly meetings start at 10 a.m. The meeting room is at 9:30 a.m. Membership dues are $25/year. If you are interested in joining DVHSG, or in visiting a Guild meeting, please contact us at dvhsg@yahoo.com. Follow us at DVHSG Blog or on our Facebook page.